In the height of enthusiasm for the summer Olympic games, comes injury and disappointment for some top athletes. Many of these athletes will seek treatment from a sports physiotherapist or physical therapist to be able to continue their competition. The role of these medical practitioners is not only to treat the pain and injury, but also to support the athlete in a way that he or she may continue to compete at a top level. Physiotherapy or Physical therapy…what is the difference? The term physiotherapy is more commonly used in Australia and Europe. It relates to those who have an expertise in musculoskeletal care and movement. The primary focus of physiotherapy is on an individualized integrative care that heavily involves the use of manual therapy techniques. These techniques are followed up with movement re-education to prevent re-injury and enhance performance. Traditional physical therapy in America has been integrated in the medical system as more of a rehabilitative process. Both professions require a higher level of education and further skill acquisition to provide the best in quality of care. What do the “good hands” and skills of a Sports Physiotherapist include? Everyone deserves the same care as an Olympic athlete. There is also no one-treatment method that works for everyone. The key to good care is to find a good therapist who has a toolbox full of skills and experience to find the best care to fit your needs. 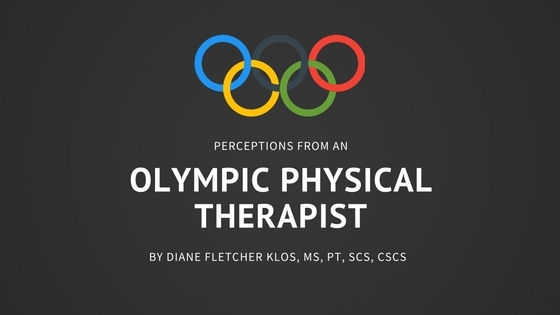 Diane provided sports physical therapy care at the 2002 Olympic winter games in Salt Lake City, Utah.